Beit El Sennari is not well known by many tourists who visit Egypt. Situated on a small lane named Haret Monge, just off of a downtown street called Khairat, there are very few tourist attractions nearby.Sennari House was built in 1794 by Ibrahim Katkhuda El-Sennari, a Sudanese occultist, it is famous for another reason. In 1798, Napoleon invaded Egypt bringing with him an army of scientists, scholars and artists to establish a French culture base in Egypt. Soon, they began their mission of making the first European study of Egypt which they published as Le description de l'Egypte. Sennari House "Beit El Sennari" was used to house many of the French artists and scholars at the time. It became the center of the French study of Egypt, and therefore a very important monument to early Egyptology.This was exactly what I did. After leaving the metro I had to walk for about 15 minutes before reaching the house. Upon making my way through this door, I found myself in an old garden that I found out later was the main garden of the house. Here, I found many old palm trees, along with some construction work, as the museum is still under restoration. 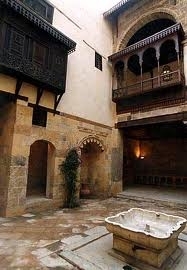 Typically, the house surrounds this open courtyard, and it was used, particularly in the mornings, as a reception place. The sahn of El Sennari House is very beautiful. There is a very old fountain. The sahn is an excellent place to see most of the mashrabeya screens of the house, as they are built to overlook the courtyard.There are many mashrabeya screens all around the house and in a very good state. They are of the finest variety, made of very small pieces of wood in tight patterns, and many have additional arabesque carvings within the wood. To the left on the second floor, one's eyes are drawn to a very attractive balcony with wood work all around it. As both a historical house, and the centre of work surrounding the scholars in the Napoleon expedition, it deserves, and will probably someday receive, more attention. But probably only then will it find an audience of tourists. Nevertheless, even today it does have its charm, but only those very interested in such places will appreciate its appeal.